Happy New Year folks! A brand new year, means we're bringing in brand new stuff! Only about 77 new styles to be exact... And the styles just keep getting better, year after year. We have high expectations this year and we're just as excited as you are for this coming Spring & Summer. We've been working hard, diligently and listened to each and every one of you. Yes YOU! You are that important to us, really! Your thoughts, your feedbacks, good, bad, sometimes even harsh (Lol no pun intended) we've heard you and we're listening. Curating all these new styles were truly fun and what's amazing for 2016 is that we know you'll love them too. The ISS ImprintedSportswear Show in Long Beach, CA. If you're new to this and haven't been, well it's one of our BIGGEST shows like...ever! For OVER 35 YEARS the ISS (Imprinted Sportswear Trade Show) has established themselves to be one of the largest and biggest tradeshows ever dedicated solely to the decorated apparel industry. It is a NATIONWIDE tradeshow, showcasing great vendors and manufacturers like ourselves to consumers like you. From screen printing, embroidering, stenciling, and appliquéing supplies to basic blanks staples, t-shirts, sweaters, hoodies, children's wear, infant/baby apparel, hats, bags and so much more! You will only find the BEST selection of vendors and unique styles with supplies and printing equipment you'll ever need. And we're PROUD to be one of the most favorable exhibiting manufacturers and apart of the ISS family for over +15 years. YOU! This is a calling for all apparel decorators. Whether you're a NEW small retail company looking for new styles, a brand marketer for Warner Brother's Studios, a licensed printing company for big brands, theme parks, music labels, or a promotional products company for local communities, etc...you name it!! This is the show just for YOU. It is the beginning of the year and you should attend to get REFRESHED. Go and touch & feel your favorite products in person. See what's new, hot, and trending for the New Year! It's important to attend to get a new perspective on the industry with new ideas and to see unique apparel for your new line-ups of the year. You get to see the latest styles UP CLOSE in PERSON, new printing techniques and technologies to grow your business. This is an INTERACTIVE show! That means you get to meet & greet with industry experts and network with your favorite brands and top manufacturers. You get to see the latest styles, new machines, equipments, supplies even softwares. 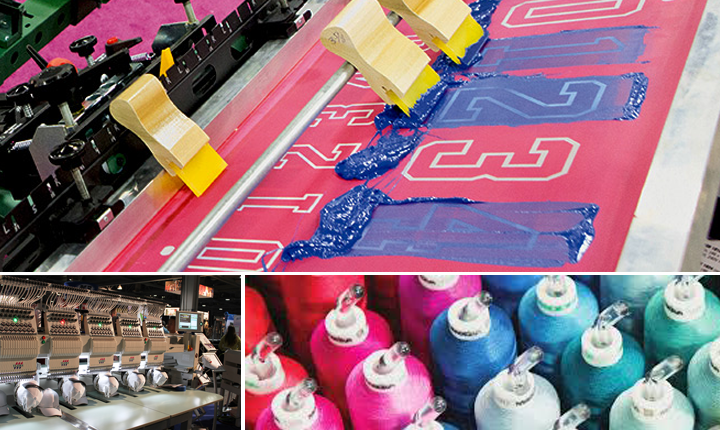 Classes, demonstrations, seminars are available to learn just about anything and everything you need to know in the apparel decorating business. SEE IT LIVE IN ACTION! Demonstrations are given daily every day on the latest screen printing equipments, DTG (Direct to Garment) printers, embroidering machines, heat transfer machines and specialty supplies such as performance stretch inks, glitter threads, glitter vinyl's etc. How to attend? Attendee FAQs. If you are new the decorated apparel business, ISS Long Beach has veteran speakers teaching the many conference seminars and hands-on workshops. Learn from the pros what works in screen printing, embroidery, graphic design, photoshop applications for apparel, pricing embroidery, Internet marketing for t-shirts, digitizing artwork and the workings of the t-shirt business. See the Long Beach imprinted sportswear show conference schedule for speaker bios, class schedule and relevant topics. Imprinted Sportswear Show in Long Beach in the largest trade show dedicated to the decorated apparel industry. The tradeshow is available to retailers, brand marketers, and other industry professionals. Long Beach Convention and Entertainment Center.